The early Middle Eocene locality of Grube Messel, near Darmstadt (Germany), is famous for its complete vertebrate skeletons. The degree of preservation of soft tissues, such as body silhouettes, internal organs and gut contents, is frequently remarkable. The present specimen was analyzed for remnants of the reproductive system. 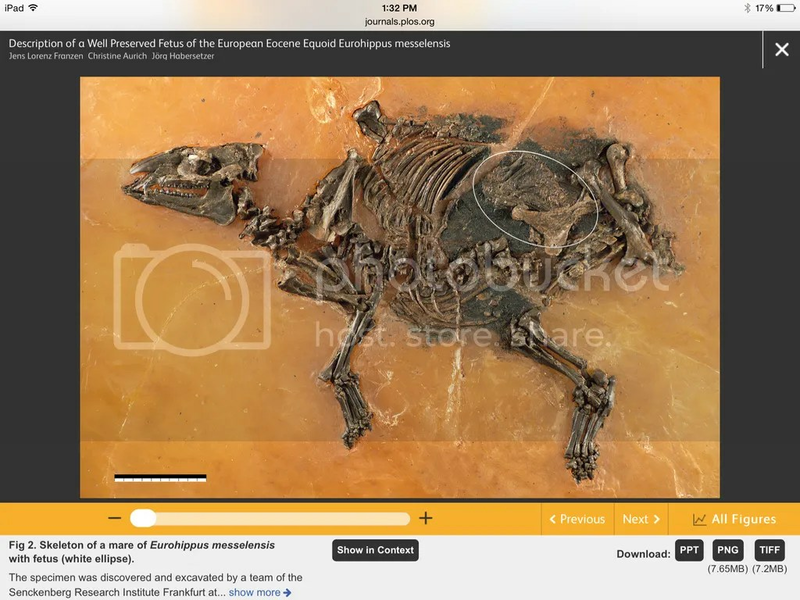 Classic anatomy and osteology and high-resolution micro-x-ray were applied to describe the fetus of the European Eocene equoid Eurohippus messelensis. Scanning electronic microscopy (SEM) was used for determination of soft tissue remnants. The fetus is the earliest and best-preserved fossil specimen of its kind. The postcranial fetal skeleton is almost complete and largely articulated, allowing the conclusion that the pregnant mare was in late gestation. The apparent intrauterine position of the fetus is normal for the phase of pregnancy. Death of mare and fetus were probably not related to problems associated with parturition. Soft tissue interpreted as the uteroplacenta and a broad uterine ligament are preserved due to bacterial activity and allow considerations on the evolutionary development of the structures.